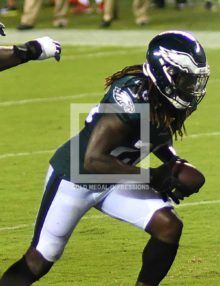 Philadelphia Eagles running back JAY AJAYI scores the first of two touchdowns in the third quarter against the Atlanta Falconds giving the Eagles a 10-6 lead. The Eagles went on to win their home opener 18-12. 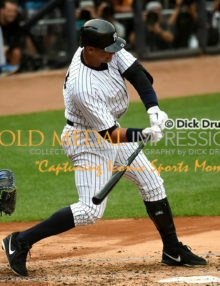 Check out these 5 selected images from tonight’s NFL opener, won by the Philadelphia Eagles 18-12. This was one of the sloppiest football openers that I have seen in many years, with 26 penalties and in general poor play by both teams. 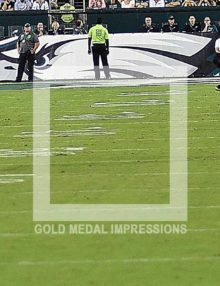 The game was highlighted by two touchdowns by Eagles running back, JAY AJAYI, and the surprise use of the ‘PHILLY SPECIAL” play originated at last years Super Bowl. This time, trailing Atlanta with a 3rd and 5 midway through the third quarter, Corey Clement flipped the ball to Nelson Agholor who passed it to NICK FOLES for a 15yard gain leading to go ahead touchdown by JAY AJAYI. While the Eagles defense played well, particularly in the fourth quarter, the Eagles will have to significantly improve if they hope to repeat a Super Bowl champions. Trailing 6-3 in the third quarter, Eagles coach Doug Peterson resorted to the “Philly Special” play which he used successfully in the Super Bowl. On a 3rd and 5 yards to go, Corey Clement took a toss and flipped to Nelson Agholor who threw a 15 yard pass to Nick Foles. Shortly after this play, The Eagles scored and went ahead 10-6. 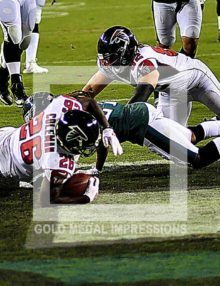 Philadelphia Eagles cornerback, RASUL DOUGLAS, makes a critical interception of a Matt Ryan pass intended for JULIO JONES in the fourth quarter. The Eagles went on to win their home opener 18-12. 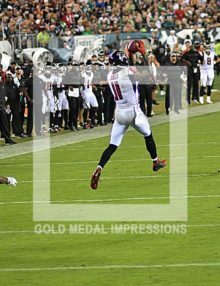 Atlanta Falcons wide receiver JULIO JONES leaps into the air to receive a pass from Matt Ryan in the fourth quarter against the Philadelphia Eagles. Shortly thereafter, Tevin Coleman scored to put the Falcons ahead 12-10. The Eagles went on to win 18-12. Atlanta Falcons running back TEVIN COLEMAN scores on a 9 yard run giving the Falcons a 12-10 lead in the fourth quarter. The Eagles came back, however, to win 18-12. Use of the ‘PHILLY SPECIAL” play originated at last years Super Bowl. This time, trailing Atlanta with a 3rd and 5 midway through the third quarter, Corey Clement flipped the ball to Nelson Agholor who passed it to NICK FOLES for a 15yard gain leading to go ahead touchdown by JAY AJAYI. While the Eagles defense played well, particularly in the fourth quarter, the Eagles will have to significantly improve if they hope to repeat a Super Bowl champions.